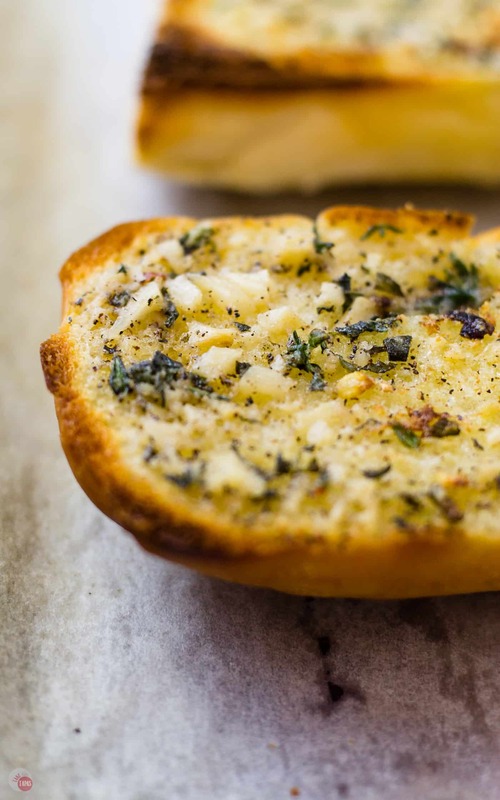 Make your own Roasted Garlic Spread with fresh herbs and use it to make the most amazing gourmet garlic bread! After making a roasted chicken the other day I was left with some fresh herbs. I didn’t want them to go to waste so I chopped them up, along with some roasted garlic cloves that I had leftover from my trip to the olive bar, and added them to a little butter that I had softened on the counter. The result is a masterpiece! 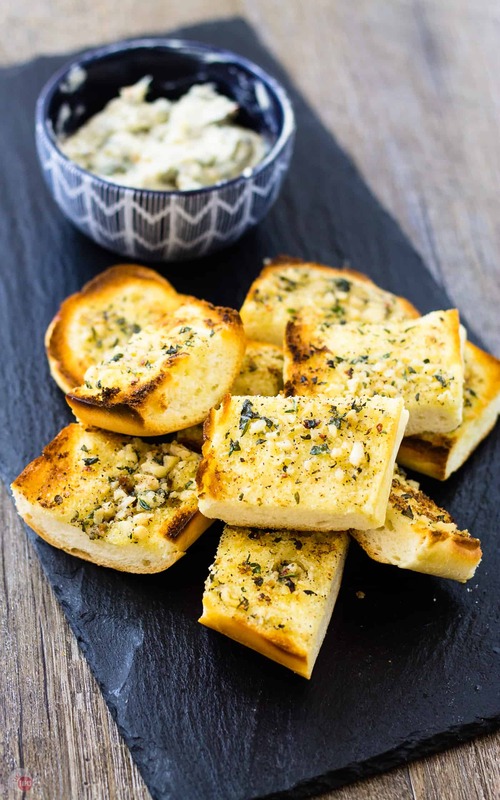 A roasted garlic spread with herbs that you can add to chicken, pork, or some leftover bread to make the most amazing gourmet garlic bread ever! Before we moved to Arizona I will admit that I wasted too much food. Such a crime!! I am a food waste felon! I would buy so many groceries at the store with the intent of cooking at home instead of dining out. With a hubby that was gone all the time and kids that are super picky, I would give up and just grab something out. Costing even more money! 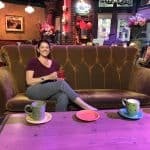 Am I the only one or does this sound like you too? Since moving to Arizona, the hubby has been home just about every night and with groceries costing so much less here, I am happy to say that I am cooking at home most nights. We will eat out on certain occasions like sandwiches for the starving kids after school and our Sunday ritual of burritos and rolled tacos from this amazing burrito place down the street. Their salsa is to die for!! One other thing I have gotten good at is using leftover bits and pieces to not waste anything! Do you have leftover fresh herbs? I can’t grow anything so when I want fresh herbs I have to buy them. I have tried buying the herb plants but they still die after a day or two so I have to buy the packages of fresh herbs. In preparation for roasting a chicken the other night, I bought the Poultry Seasoning packet of fresh herbs. Sage, rosemary, thyme all ready to go. I bought a package of oregano too for good measure. Once I prepared the chicken I was left with a few sprigs of the thyme, rosemary, and oregano. I couldn’t let it go to waste but I didn’t have anything planned out for the next few days that I could use them in. At the same time, I was roasting a few heads of garlic I had bought at the market for a dip I am working on. Need help roasting garlic at home? Check out this post from Dish of Daily Life on how to roast your garlic at home! Elevate leftovers to a whole new dish! I took all the leftover herbs and chopped them up. The small bowl of butter I keep on the counter had a little over a half a cup left in it. The lightbulb went off in my head. 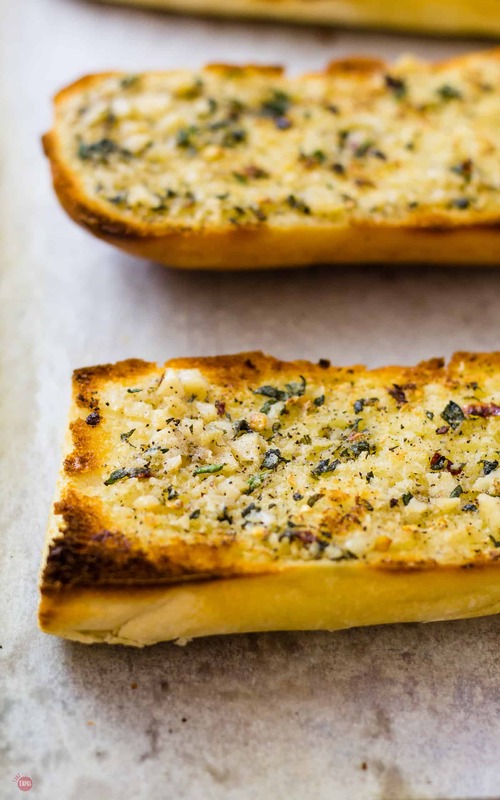 Butter, herbs, roasted garlic… Does anyone want some garlic bread? 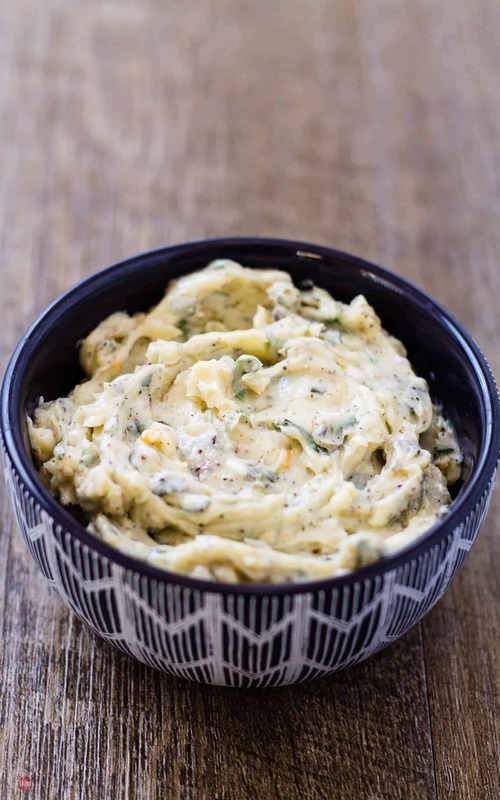 Combining the butter, fresh herbs, roasted garlic, and a few other spices tossed in made the most amazing compound butter/spread I have ever tasted. 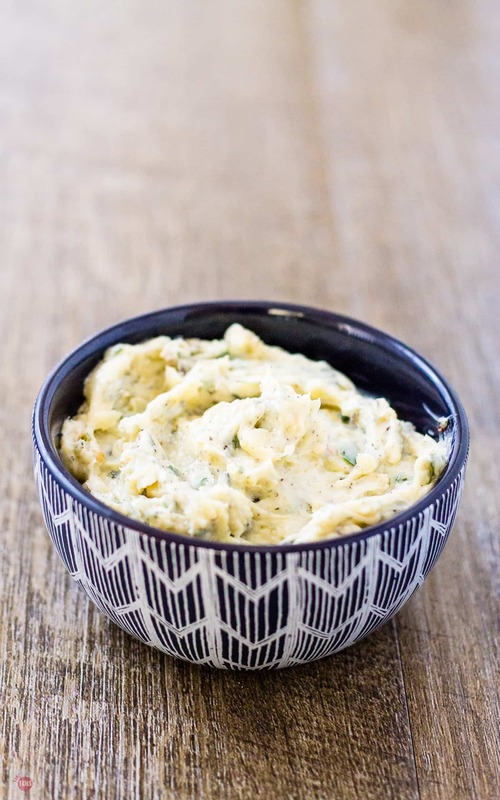 Roasted garlic spread that can be used in so many foods! The first thing I wanted to make with this roasted garlic spread was garlic bread. I already had my grandma’s Rigatoni on my brain but garlic bread will go perfectly with my Grilled Tomato Soup too! I don’t usually have a lot of bread on hand, mostly because I would eat the mess out of it, but because we are all so picky about the type of bread. The local Jimmy John’s sandwich shop has the best bread for making sandwiches and I recently learned that you can buy the day old loaves (or any loaf 4 hours after it’s cooked) for $0.49 a loaf!!! If the kids and I happen to go out for sandwiches after school I will buy a loaf or two and bring it home. When I mixed this roasted garlic spread together, I was so happy to see a loaf of bread still on the counter. I took the loaf, sliced it open and spread a generous amount of the roasted garlic spread on each half. About 5 minutes under the broiler and this amazing garlic bread came out of the oven. I haven’t seen the men in my house run to the kitchen that fast in a long time. Within seconds all the bread was gone. No time to take pictures of the garlic bread that day because all that was left were crumbs. I had to wait until I got more “day-old” bread so I could make it again for the pictures! 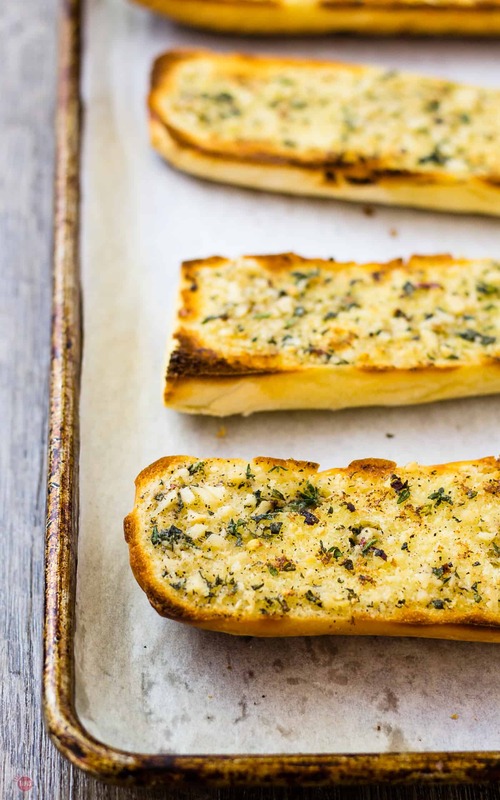 If you love garlic bread as much as I do you will love this roasted garlic spread. Whip up a batch with your leftover herbs and store it in the refrigerator for up to two weeks. Don’t’ forget you can add the roasted garlic spread to your pasta, chicken, pork, or even on top of your steak! Mix together all the ingredients until fully combined. Split open your bread of choice. 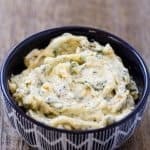 Spread a few tablespoons of the roasted garlic spread on each half. Place the bread on a baking sheet and broil on high for 3-4 minutes or until toasted to your liking. Remove from the oven and let cool for a minute. What a great use of leftover herbs! I know! And it is different every time depending on what you have leftover!